HERNDON, Va., June 21, 2018 — Learning Tree International (OTCQX: LTRE) announced today a 100% hands-on online certification program for the Certified Cloud Risk Management Professional (CCRMP) sponsored by Mission Critical Institute (MCI) and designed to expand the pipeline of job-ready cloud risk management professionals. 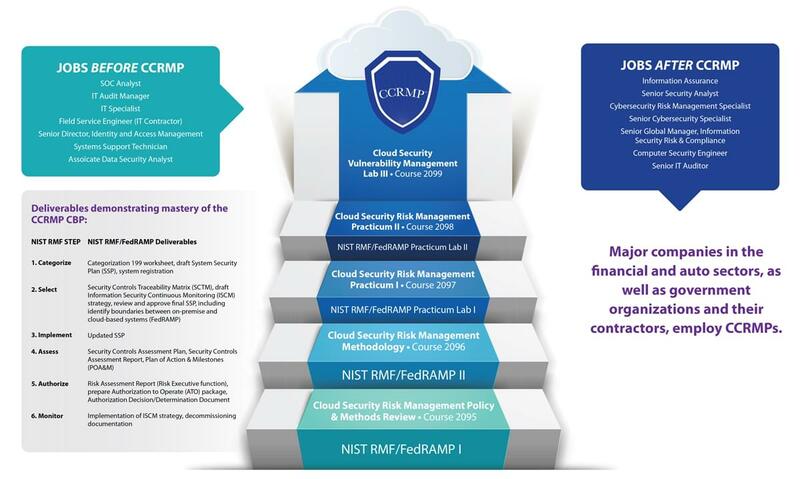 The CCRMP certifies that members of the Learning Tree community have become cloud risk management job-ready by successfully completing hands-on projects producing NIST Risk Management Framework and FedRAMP deliverables. "This new affiliation with MCI will enable public and private sector organizations to address the critical need for additional cyber and cloud security professionals globally,” said Richard A. Spires, CEO, Learning Tree International. “Under this program, attendees can gain valuable and practical NIST Risk Management Framework and FedRAMP experience, earn a hands-on cloud risk management certification, and progress toward leadership positions." The 5-course curriculum is based on recommended industry standards and cloud/cyber security risk management best practices developed by the U.S. Department of Commerce’s National Institute of Standards and Technology (NIST). Attendees enrolled in this MCI sponsored program receive online instruction and mentoring through a practitioner-developed cyber security curriculum, which is taught by expert practitioner instructors. As they continue to work full-time, the cloud security curriculum enables attendees to become cyber job-ready by working in a virtual NIST RMF/FedRAMP lab. Upon completion of five CCRMP courses, attendees receive the hands-on Certified Cloud Risk Management Professional (CCRMP) certification. "Learning Tree stood out as an excellent partner because of its extensive reach to IT and cyber professionals who can move into cyber and cloud security management and leadership positions, and help address the accelerating growth of unfilled cyber positions," said Dr. V. N. Berlin, MCI president. "Through our partnership, Learning Tree and MCI greatly expand access to online cyber security risk management education that meets workforce needs, and that also prepares students to be job-ready at graduation." "The combination of Learning Tree’s relationships with the IT industry sector and MCI’s unique cloud security risk management certification programs greatly benefits Learning Tree’s community of IT professionals as well as organizations seeking job-ready cyber and cloud risk management candidates," said Mr. Spires. This online cloud security certification training program will be available globally through Learning Tree International’s U.S. operating business serving all of North America, Europe, the Middle East and Africa (EMEA) as well as the Scandinavian countries. MCI advances cyber security careers and thought leadership by developing career-path-focused cyber security education and training programs. MCI programs have served more than 12,000 learners worldwide seeking cyber security training, certifications and degrees. Employers that have benefited from collaboration with MCI include Booz Allen Hamilton, Harris Corporation, Wells Fargo, Toyota of North America and the departments of Defense State and Veterans Affairs. The MCI NIST Risk Management Framework curriculum has been recognized by the Department of Homeland Security. MCI is an academic partner of the International Council of E-Commerce Consultants (EC-Council). Learning Tree International is a trusted, global partner delivering mission-critical IT training and certifications, as well as the communication and critical thinking skills necessary to effectively deploy and deliver major IT initiatives. Over 2.5 million IT & business professionals around the world have enhanced their skills through Learning Tree's extensive library of proprietary and partner content. Today, Learning Tree offers an expanded training portfolio, including Agile, cyber security, cloud computing, program/project management, web development, operating systems, networking, leadership, and more. Attendees enjoy award-winning content that goes beyond the classroom with customized blended learning solutions featuring instructor-led, on-demand, and online training through Learning Tree AnyWare®, a modern technology platform that delivers an immersive, virtual learning experience.